It is a well-established fact that Muslims do not vote for the Bharatiya Janata Party (BJP) in large numbers. This is especially true in Gujarat – a state with a strong history of anti-Muslim riots often accompanied by accusations of state involvement – where the BJP has been in power for more than two decades. Yet a small fraction of Muslims do vote for the Hindu nationalist party in Gujarat. Political scientist Raheel Dhattiwala’s booth level analysis in seven assembly constituencies of Ahmedabad during the 2012 elections shows the percentage of Muslims voting for the BJP to be around 10 percent. It becomes important to then ask: Who are the Muslims who are voting for the BJP in Gujarat? Among Gujarati Muslims, the BJP is predominantly supported by the Dawoodi Bohras (a Shia community), led by its religious head called the Syedna. The last Syedna, Mohammed Burhanuddin, known to be an extremely orthodox figure, explicitly supported Narendra Modi, the then Chief Minister of Gujarat. In 2011, when Narendra Modi launched the Sadbhavna Mission to promote communal harmony in Gujarat, it was the Dawoodi Bohras who turned up in large numbers. When the Syedna Mohammed Burhanuddin passed away in 2014, Narendra Modi, paid a special visit to his successor, Syedna Mufaddal Saiffudin, to offer his condolences. Distinguished by their white and golden coloured caps and colourful rida costume for women, Dawoodi Bohras are a community of wealthy traders who reside mainly in Gujarat and financial hubs like Mumbai. Despite the destruction of shops and businesses suffered by the community during the 2002 riots, the Bohras continue to support the BJP given its pro-business policies and to remain close to power. Dawoodi Bohras’ current leader Syedna Mufaddal Saiffudin has praised Prime Minister Narendra Modi’s Make in India project. This is similar to Shia leaders in Uttar Pradesh supporting the Hindu nationalists. Sufi Muslims have also supported the BJP. For instance, BJP Gujarat’s minority cell chief Mehboob Ali Chisti claims to be a Sufi saint. Recently, Sakhi Bava, a Sufi from the Kheda district of Gujarat joined the party with his followers. There are three reasons why the Sufis prefer the BJP. Firstly, Sufis are a minority within a minority: their numbers are dwindling as they are alienated by mainstream Islam now represented by the orthodox Deobandis/Tablighs. Secondly, the BJP cannot afford to be seen with the conservative Deobandis for fear of threatening its core support among its Hindutva supporters. Sufis, on the other hand, believe in a liberal version of Islam and heavily borrow from the local, ritualistic Hindu practices such as trance, black magic, cult system represented by the Chishtis, and endogamy which has similarities with Brahminism/caste system. Sufi Islam Indianized itself through interactions with the South Asian sub-continent’s prevailing traditions. Because of the cult system, the Sufis enjoy a network of followers who vote based on the Pir’s order. In effect, the Sufi vote-bank helps the BJP. Thirdly, the Sufis are a rich and landed community (like the Dawoodi Bohras). They get to handle the Wakf Board, which is the third largest owner of properties in India after the Indian Railways and Indian Defence. There have been recent cases of encroachment on the properties of the Wakf Board. Being close to the BJP is thus crucial for the Sufis to stay in a position of power in the Wakf Board and manage properties. Despite the support given by these economically powerful business communities, the BJP has not fielded a single Muslim candidate in Gujarat’s legislative assembly elections since 1995. Since the Muslim communities supporting the BJP focus on business-related patronage concerns, it allows the BJP to overlook the issues of the socio-economic marginalization of Muslims, state-led ghettoization via the Disturbed Areas Act and the everyday violence that they face in a communally polarized Gujarat. The BJP has however put up Muslim candidates in local body elections in the recent past; roughly 350 such candidates won elections. In the run-up to the Gujarat state assembly election in 2017, the party made efforts to reach out to Muslims, as its core support group, the Patidars were agitating against it. Members of the BJP’s minority cell from Mumbai were called to campaign in the Muslim localities of Surat and nearby areas. However, hopes of the BJP fielding Muslim candidates especially in some of Ahmedabad city’s constituencies covering Jamalpur-Khadia and Juhapura, were ill founded. The party did not give a candidature ticket to a single Muslim in the 2017 election – a trend that it has not broken since coming to power. In fact, the BJP’s electoral campaign relied on a sly anti-Muslim rhetoric. At a public meeting in the Banaskantha district, Prime Minister Narendra Modi accused senior Congress leader (since suspended) Mani Shankar Aiyar of arranging a contract to kill him with Pakistan. He compared Rahul Gandhi’s elevation to the post of President of the Congress party from his Vice-President post as ‘Aurangzeb Raj’ to invoke communal passions. 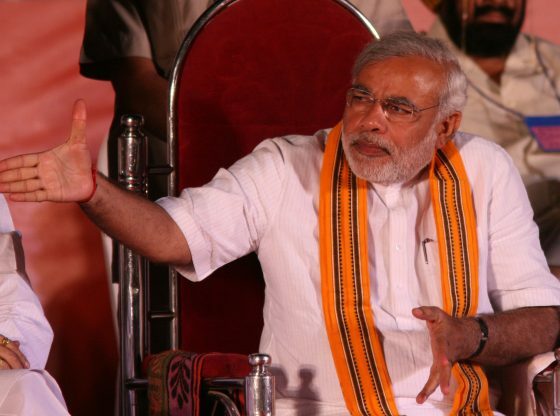 Modi also attacked the Congress for having arranged a ‘secret’ meeting at Aiyar’s house with former Pakistani high commissioner, former external affairs minister of Pakistan, Hamid Ansari (India’s former Vice-President), and Manmohan Singh (India’s former Prime Minister) to discuss the Gujarat election. He made a reference to Ahmed Patel’s name as the next Chief Minister of Gujarat to convey a fear that a Muslim could be the state’s Chief Minister if Congress was elected. None of this should conceal the fact that Rahul Gandhi toured the state making visits to several temples. He deliberately did not go to a single mosque/Dargah as he feared coming across as pro-Muslim, thus giving a campaign advantage to the BJP. The state’s environment also vitiated on communal lines with posters in Paldi – an upscale locality of Hindus & Jains in Ahmedabad with a few Muslim-dominated pockets – warning of the dangers of it turning into another Juhapura, the biggest ghetto of Muslims in India located in Ahmedabad. All in all, this ensured that the Muslims remain a neglected, demonized, and invisible entity in Gujarat. It seems these kind of Muslims have lost all human dignity apart from their Imaan . They have become like shameless pigs or dogs. Imagine running after a man who committed a genocide on their community no matter what sect. First of all it is forbidden in Islam to create sects among themselves according to the teachings of the Prophet. “I do not know those who divide themselves into sects. I have nothing to do with them” he said. These were his words. Yet these so called Muslims have fallen into the trap of Modi who is simply using sectarian divide for his advantage. When will these cowards learn? Learn from the brave Palestinians. Learn from the brave Kashmiris. Learn from the teachings of the Qur’an how to fight against human oppression.